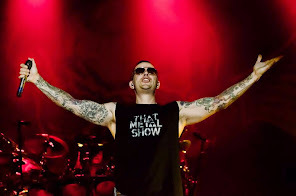 3voor12 talked with M Shadows about the seven commandments that make his life better. 1. Friendship always comes before business. 2. Never forget what the base is: hard rock and heavy metal. 4. Play golf as much as possible. 5. Invest in a good live show. 6. Songwriting is more important than technique. 7. Never cut your hair because it is said that long hair isn’t cool anymore.